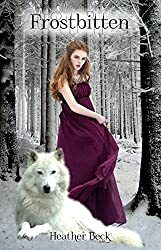 Frostbitten by Heather Beck is a YA paranormal romance following Anastasia after her move to Cedar Falls where she meet mysterious outcast Frost. Anastasia is lonely and misunderstood. When she moves in with her grandparents, she’s expecting that to continue. And it does, somewhat, except for Frost. The one boy everyone warns her to stay away from. But he saves her life, and she can’t avoid him anymore. Especially not after she finds out his secret. I thought the idea for Frostbitten was excellent. The creation of the werewolves in this tale is good. However, I was disappointed with the character development. I felt stunted and cut off from Anastasia and Frost, not finding them unique in and of themselves. This is a YA book, and teens do some stupid things (I was one, I remember). But I felt like it was a little cliched. But the plot line was still good, so I wanted to finish the book to see how it ended! If you like the sound of this one, check out Frostbitten on Amazon or via Heather Beck’s website.